1975 was a momentous year on many levels. The war ended in Vietnam, the Suez Canal re opened, Watergate hit the headlines and Britain voted to join the EU as just a few key events. Bowie was in full major Tom mode and Jaws made folk not want to go in the water for the first time. Technology leapt forward too and it would herald in the digital camera. But that might not be in the way you think. Many folk label Steven Sasson’s prototype camera made for Kodak as the first digital camera. 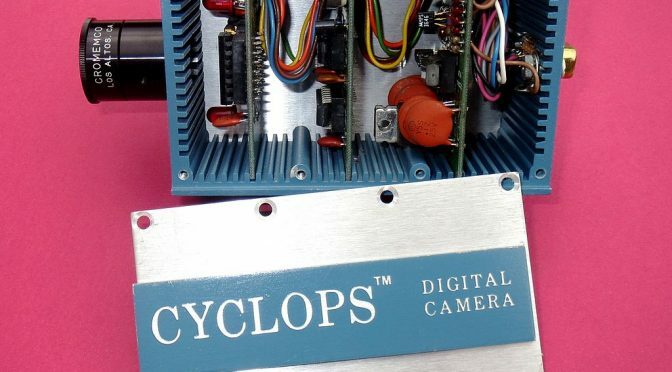 But depending on how you define Digital camera the Cromemco Cyclop beats it, as does some space based tech. It isn’t standalone or portable. But it does allow you capture digital images interfaced to the Altair. It produces a 32×32 pixel digital image. The sensor used was actually a everyday 1kb MOS memory chip. By replacing the usual opaque cover with glass the 1024 memory locations acted as photo receptors. These were in a 32×32 array. If the these were charged to 1 and then exposed to light the the charge would move to 0. The speed of change depended on how much light fell on each memory location. The memory array was scanned quickly 15 times allowing for a readout to calculate a basic gray scale pattern. Modern CMOS sensors do this a bit more elegantly with transistors attached to the photosensor components. The cyclops creators actually started formulating their idea before ’75. We know Dr Garland wrote to Popular Electronics in 1974 about the cyclops but it would take the arrival of the Altair 8800 to make the dream a reality. The Altair wasn’t just the missing link for the Cyclops. It launched the PC revolution and led to the creation of Microsoft whom developed its BASICS OS. The camera was originally described as DIY project in Feb edition of Popular Electronics 1975 a mere month after the launch of the Altair 8800. You can still build it from scratch yourself as this Hackaday post describes. The Cromemco commercial version followed and was a huge success for Melen and Garland’s proto company. Cromemco would become one of the early giants of the computing business. Kodak’s camera is arguably more what we think of a digital.Self contained, portable and uses storage media (cassette tape). Although at 8lb (~3.6kg) in weight, it is not exactly luggable. Unlike the Cyclops, the captured image is buffered in on camera RAM before being transferred to the storage material. It takes 23 secs to write the image onto the tape. It uses a CCD sensor. CCD sensors produce an analogue output so require digital conversion making them more expensive and power hungry than CMOS sensors. in the 90’s and 00’s they were very much seen as better than CMOS but in the last few years CMOS chips have caught up. The Kodak gives 100×100 pixels greyscale images. Images can be viewed on a TV screen. Unlike the cyclops it wasn’t developed to be used with a computer. Unlike the Cyclops this never went commercial. It would take others to give us digital cameras as we know in the coming decades.